Google AdWords is Google’s advertising network. It allows you (the advertiser) to show your ads across Google and all the sites that belong to the Google Adsense publishers network. AdWords is a pay-per-click program, so you only pay when someone actually clicks on your link. If noone clicks then you don’t get any visitors and you don’t pay anything. It is also a bidding based network, so popular word or phrases cost more because more advertisers are bidding. The Google Adwords administration area allows you control over advertising spending, costs per click and tracking of the performance of your advertising. 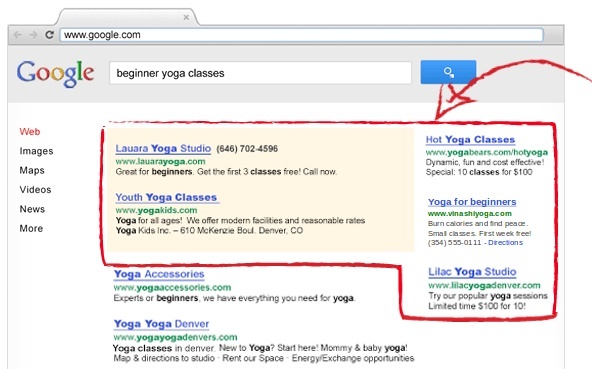 On Google, someone searches for “yoga”, they then see the results page for that search term. The paid results are shown in the red block, the natural (free) results, appear below them. Much the same applies for mobile devices. The paid results appear above the free results. They have a slightly yellow background to separate them from the natural results. If you select to advertise through the search network as well as on the Google search pages your ads will appear on other sites that are part of the Google AdSense program. Your ads will appear on sites that are similar in nature to the keywords you are bidding for and similar to the content of the page where people clicking on your ad will go. e.g. 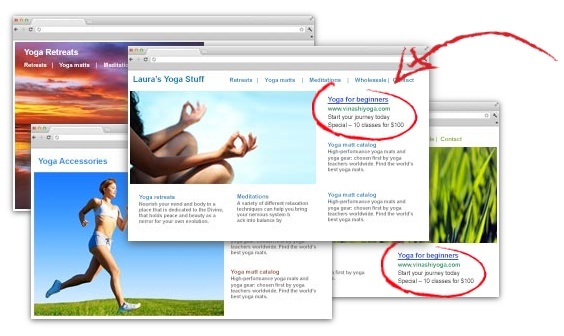 Your ad for “Yoga mats” might appear on a site about yoga because it closely matches the content of the site. People who are there are likely to be interested in your offering. However, your “yoga mats” ad will be less likely to be seen on sites that focus on golf because the content doesn’t match. It’s not this simple and golfers might actually be interested in yoga mats, and the particular visitor might have just been to a yoga site, so you ad could still appear on the golf site. This is all part of Google’s secret sauce. If you as an advertiser want to appear in the paid results, you need to bid for a position. 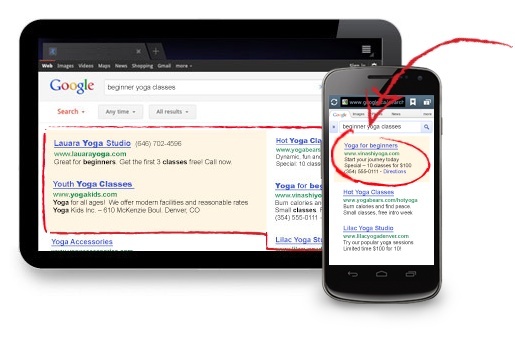 Within the Google AdWords dashboard you set a maximum bid for “yoga”. The maximum bid varies, depending on the popularity of the search term. You can set the maximum as high as you like, too high and you’ll blow your budget very fast, too low and you might appear very seldom in the results. Google wants quality. When you make a bid they analyze the page you will send people to through your ad. If Google determines your site (in particular the page they’ll be sent to) to be of high quality, and the content very relevant to someone clicking through to it, that’s good for you. This quality reduces your bid, and increases your exposure, because Google wants to give the best quality in search. The more you’re willing to pay for a position, the more exposure and views you’ll get. However, quality is more important, and even with obscenely high bids you could lose out to an advertiser who has a high quality site that Google sees as more relevant. Every advertiser will get a turn to show up in the results. After the factors above, after some time you will still show. It’s best to try skip the line by making sure your site’s quality is top notch. 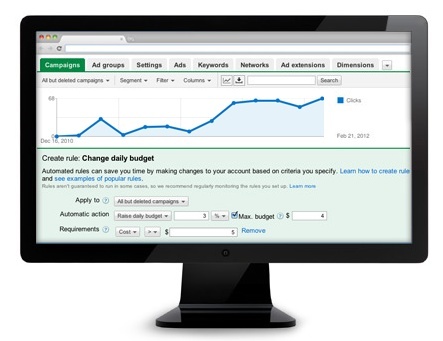 The Google AdWords dashboard keeps detailed statistics on the performance of all your advertising campaigns. These campaigns can also be tied in with a Google Analytics account to not only track the performance of the ads, but link those ads to specific outcomes. For example, you can track how many people click on your ad, how many of them actually stay on the page you send them to and then how many of them fill out a contact form for more information. From there you can tweak the ad, tweak the content of the landing page and maximize your ROI for your advertising budget. CPC is how much a single click costs on average. This is determined by Google. Popular phrases cost more. You will get an idea of what the average is beforehand, but yours could be more or less than the estimated cost. Maximum bid is the maximum you are willing to pay for a single click for a phrase. Note that you can have many phrases, all with differing maximums. Daily maximum means your ads will stop showing when your daily budget has been exhausted. You can click here to see the official AdWords page on Google. We are a family business with a passion for developing websites for the small to medium business. Nowadays every business needs a web presence. We'll help you to turn your website into an effective business tool that works for you.